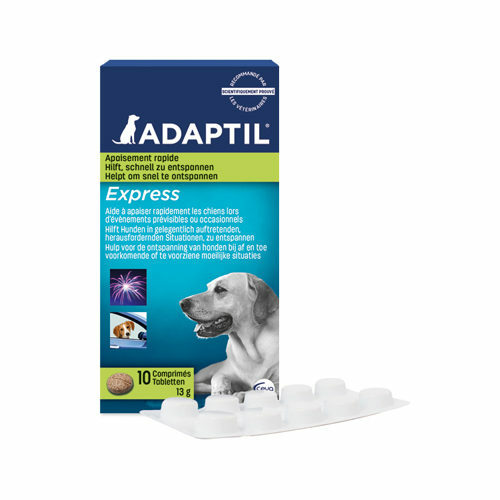 Adaptil Tablets for dogs are a temporary solution for anxiety over fireworks, thunderstorms and travel. Tasty Adaptil tablets act quickly and can provide temporary relaxation in stressful situations such as during fireworks, travel or thunderstorms. Unlike the other Adaptil products, Adaptil tablets do not work on the basis of pheromones. The tablets contain a combination of natural amino acids, GABA and vitamin B complex. Many scientific and clinical studies have proven the positive effects of these natural active substances in reducing anxiety. Fast action! (On average within 2 hours). Safe: Does not drug the animal, simply relaxes it. Y-aminobutyric acid (GABA) relaxes and reduces stress (effect often visible within an hour). Tryptophan reduces stress related behaviour and anxiety. Theanine contributes to the control of anxiety and phobias. Improves learning abilities. Stimulates GABA release. Vitamin B complex, Vitamin B1, Vitamin B3, Vitamin B6, Vitamin B8 (Inositol) and Vitamin B12, all contribute to the normal function of the brain and help the body to cope with the effects of stress. Give the tablets two hours before the expected situation, by hand or in food. The tablets can be given once a day, but the effect of the treatment may be reduced if given too frequently. Adaptil is sold in packs of 10 tablets and can be used in combination with the Adaptil diffuser, collar or spray. Adaptil tablets are a short term solution. For longer term solutions, try Adaptil spray, Adaptil collar or Adaptil diffuser. Have you used Adaptil Tablets (DAP) before? Let us know what you think about this product. Given 5 stars in anticipation that they have the same effect as the spray. We have yet to use them. i did,nt use them straight away as i got them in advance for fire works but we recently had a thunder storm my dog was scared stiff so i gave him 2 within a hour he started to relax still scared because he had already heard it but alot better by taking them i wouldhighly recommend them and will buy more in the future thankyou .